The Joplin Humane Society is COMMITTED to saving lives; all lives, no matter the size, color or breed.Our Sponsorship Program has dramatically increased our lifesaving capability by allowing us to waive the fees---adoption fees for adoptive families and vetting fees for rescues.For a large number of shelter pets, this program has TRULY been a life altering (and saving) program. In just a few short months, 467 sponsored pets have been adopted and 148 sponsored pets have been accepted into rescue programs. However, even with these amazing numbers, we realize there is still much work to be done; certain animals are often over-looked because of their color, breed or age. Senior pets, black dogs and some breeds are less likely to be chosen by an adopter when they are so overwhelmed by the many choices of pets that are available. We also recognize the challenges that a rescue will face when accepting and placing those same pets; their goal is to save as many lives as possible and some pets just take LONGER than others to find homes, which can potentially tie up foster homes for months. We needed a way to move these pets from the "least likely list” to the "gold star list”; and so the "STAR DOGS” program was born! "STAR DOGS” will be 100% sponsored dogs including all vetting. "STAR DOGS” are not promoted as FREE DOGS or CHEAP DOGS but rather INCREDIBLY AWESOME DOGS that just need a little extra boost to get that second look from adopters or rescues. "STAR DOGS” sponsorships will be $105. As a "STAR DOG” sponsor, know that you are truly helping the ones that need your help the most. Each "STAR DOG’S” adoption will include not only our normal services; basic vaccines, spay/neuter and deworming….but will also include a heartworm test, rabies vaccine, microchip, collar and ID tag! What a great start that you can provide an adopted dog; and what a terrific gift to the family! Now they can use their savings to stock up on pet supplies and toys for their new best friend! ﻿Check out our current STAR DOGS! "STAR DOGS” for RESCUE will totally relieve the rescues of ALL fees involved in choosing the "STAR DOG” into their rescue. It costs our rescue friends hundreds of dollars to have necessary vetting done when bringing dogs into their organizations. Rescues will also provide whatever care is needed once they receive the dogs…some of the groups have provided amputations for damaged limbs, MRI’s to evaluate hurt bodies and orthopedic surgery to repair damaged bones.These groups are committed to helping us save lives! "STAR DOG” RESCUES will include basic vaccines, spay/neuter, rabies vaccine, heartworm test, microchip, and a health certificate which is required for transport. PLUS, if a rescue takes one of our harder to place "STAR DOGS”, they can choose any other dog from our shelter for their rescue organization for only $10---and we will completely VET that dog as well! 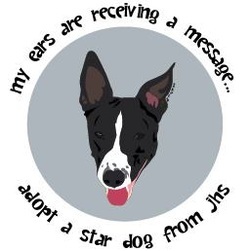 So, if you sponsor a "STAR DOG” and that dog goes to rescue, you will have truly saved TWO lives! Please email Connie Andrews at: connie@joplinhumane.org or call: 417-623-3642 x109 to complete your "Star Dog" Sponsorship.